Today my youngest son turned 13! I can't believe how the time has flown by. When we moved into our house he was only 2 years old. I went back through some photos and found this one from September 2004, on his first day of school. Five years later, here is his photo on his first day of school! He has changed so much, but deep down he is still the same little boy. He would kill me if he knew I said that (luckily he doesn't read my blog). I wish him many more birthday's full of happiness. It was a quiet celebration for us tonight. He will be having a party on Thursday with his friends at the Paintball Arena. Obviously I have changed over the last 5 years too. Back then I would never thought I would be putting him in camouflage and giving him a gun to shoot his friends, brother and sister. He tells me it will be fine......and to just think of the photos. I have been doing a bit of creating, but it is for Two Scrapbook Friends! I was feeling very guilty for not posting anything, so I decided that I would post next weeks Kit of the Week. Turns out, my youngest son, Matt, has a birthday coming up on Tuesday. He will be turning 13! I created this double-page earlier this week using products from Bo-Bunny. I wasn't really thinking of Matt's birthday when I did it, but I am sure I will have a few photos to add to this page. The kit will be available on Monday. Check our store blog for all the details! I am super busy at the store......haven't had much time for creating. Don't give up on me.....I will be back! Tonight we are hosting an online crop on the Two Scrapbook Friends forum and everyone on our creative team posted a challenge! There are over 30 people registered to participate and there is plenty of inspiration to keep you motivated! 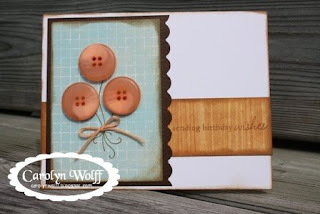 Create a layout (double or single), card, or altered item that incorporates something old and something new. The 'old' can be a tool, photo, or product. The 'new' has to be a technique. Something that you have never tried before. I created this layout as inspiration for my challenge. For something 'old' I use older photos and older products from my stash. For my 'new' technique I made the flower in the lower right corner. I saw this on the Pink Paislee blog and wanted to give it a try. Take some time and visit the forum or our layout gallery and see what all our friends have created. During the last couple of weeks of the summer we tried to cram in all the activities that we didn't get to, and one of them was going to Canada's Wonderland! We haven't been for a couple of years so the kids were really excited to check it out. Amanda and Jason each brought a friend (David and Jake) and Matt and I were park buddies (because we don't really like rides). It turns out that Jake doesn't really like rides either. I do like going on The Fly! It is a roller coaster, but it doesn't have any really big hills or loops. Amanda wanted to go on it too. Both Jake and Matt decided they would join us. Amanda and I loved the ride, but it did Jake and Matt in for the day. Feeling sorry for Amanda, I went on a few other rides with her, but they were relatively calm. While we were waiting in line for one, we were spotted by one of my customers from the store. She was there with some friends and her 2 children. We chatted while we were in line and they snapped a couple of photos which she recently sent me. A little further up in the line we were spotted again, by another customer from my store! She also took a couple of photos of us (which she promised to send me.....I will have to email and remind her). Amanda said to me that it is like we are movie stars and we need a disguise to go out in public. It seems that everywhere we go, no matter how far away it is, we are spotted by people we know! I personally love that I have friends, no matter where I am. Amanda is warming up to the idea. I often tell her that I have spy's everywhere, and I think she really believes me! Thanks to Lynne for taking these photos of Amanda and I. We will be sure to add them to our collection. Joanne and I were busy working away in the store on Friday, and all of a sudden we realized that it was our 7th anniversary. It was 7 years ago that we held our first workshop, and now we have a store, workshops every week, 2 retreats a year and a billion other things that we do. It has been a dream come true. Here are some photos that Joanne dug out.......it is okay if you laugh! 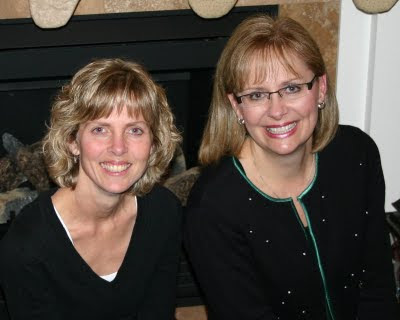 Many people cautioned both of us about going into business with a friend. We both knew that there would be ups and downs, growing pains, good days and bad days, but as long as we remembered that we were friends, it would all work out just fine. Congratulations friend! I hope we have another 7 years ahead. See you at work tomorrow! I had the day off yesterday (well, I didn't go into the store) so I wanted to try something new for dinner. We were going to have a guest (Jake) and all the kids would be there too. 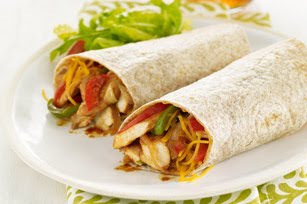 I pulled out my What's Cooking magazine from Kraft and I whipped up the BarBQ Cheddar Chicken Roll-Ups! They were delicious and really easy to make. Everyone loved them. Here is the recipe. They would be a great thing to try this weekend! SPOON chicken mixture down centres of tortillas; top with cheese. Roll up; cut in half. I served it with the yummy pasta salad recipe that I posted a little while back. Here is the link! Have you seen the Hannah Montana movie. Yes, I know.....I am 42 years old, but I love Hannah Montana. I took my niece to see the movie when it came out in theaters and then I watched it again on the plane going to CHA in Florida. Amanda is a huge Taylor Swift fan and we both love this song from the movie. Last night I got together with Karan to play with some stamps and make a few cards. We invited Joanne to join us, but she had a busy weekend and didn't make it out. I recently placed an order with PTI and I have been wanting to try them out. Time is not always on my side. Here are the 4 cards I created with my stamps. I love how they turned out. The papers I used are from Bo Bunny and they are now one of my favourites. It was a wonderful night and I am glad that I set aside the time to play. 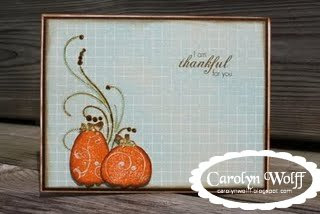 Who knows, maybe you will see this set of cards offered as a class at Two Scrapbook Friends in the very near future. A Class With Karan At Two Scrapbook Friends. 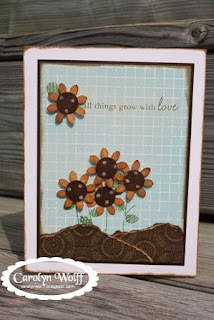 A couple of weeks ago Two Scrapbook Friends hosted an all day class taught by Karan Gerber! She was there for the entire day and taught 2 double-page layouts packed with techniques. It was my Saturday to work so I thought I might try and get these layouts done for my albums. The store was very busy and I fell behind, but I went over to my mom's that night and finished them off. I had perfect photos from our adventure to St. Jacob's so I did a page for each of my boys. All Grown Up.....I dedicated this to Jason. He is going into grade 10 this year. He is growing up so fast. I cherish all the snip its of time we spend together. For this layout we used the Heidi Swapp invisible paper that has the resist coating on it. Karan showed us how to blend our distress inks to create the background of our pages. With all her layouts there is always lots of dimension. 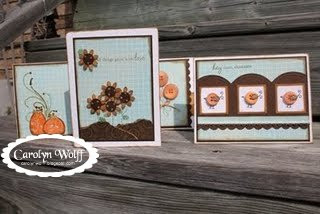 She showed us how to highlight the designs on the paper and die-cuts with Glossy Accents. I love this product. We also used Glimmer Mist to colour the chipboard hearts. The second layout was dedicated to Matt. He is almost 13 years old now. He had a wonderful afternoon exploring and hanging out with Jay and myself. Karan showed us how to transform regular cardboard into an interesting backdrop for our photos. We used Jesso and Glimmer Mist. I will never look at cardboard the same again. More Glossy Accents and bling along with a sheer die-cut for my journaling. This layout is full of dimension and texture. I just love how everything works together to create such an amazing look. My favourite part of this layout was the sewn ruffle. I have sewn on my pages before, but this technique was fun to do. If you ever get the opportunity to attend one of Karan's classes I highly recommend it. Her next one is coming up on Monday, September 21st. 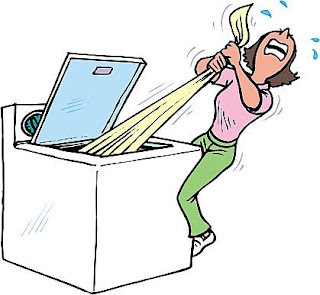 Everyone knows when you return from a vacation there is always piles and piles of laundry. It is even worse when you have been camping. Last night I started running loads of towels and bedding to get a head start. I wanted to wait until today to wash the clothes and hang them outside. The first load I ran through this morning......would not drain. This was not good! Luckily I have a very handy hubby. He is very good at fixing things. He took apart the pump and discovered a hair pin that was stuck in there. He removed the pin and we were back in business. Once I get my laundry caught up and my photos organized from our camping holiday I will be back to share.